The New Senders filter identifies emails that have been received from senders to whom emails have never been sent before. Such senders are identified by referencing the data collected in the WhitelistA list of email addresses and domains from which emails are always received. Only emails in which no spam is detected and where the sender is not present in any Whitelist are triggered by the New Senders filter. This filter is NOT enabled by default. Enable at least one of the available Whitelists to use the New Senders function. In the absence of the Whitelist functions (should no spam be detected by the other filters) received messages will be delivered to the recipient’s Inbox. ONLY emails in which no spam was detected and whose senders are not present in the Whitelist are delivered in the New Senders folder. Go to Anti-Spam > New Senders. In the General tab, select Enable New Senders to enable check for new senders on all inbound messages. 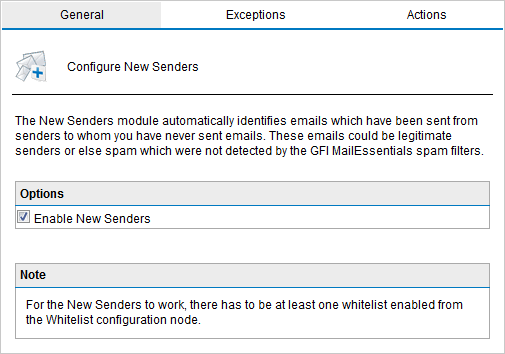 From Exceptions tab, configure recipients whose emails are excluded from the New Senders check. 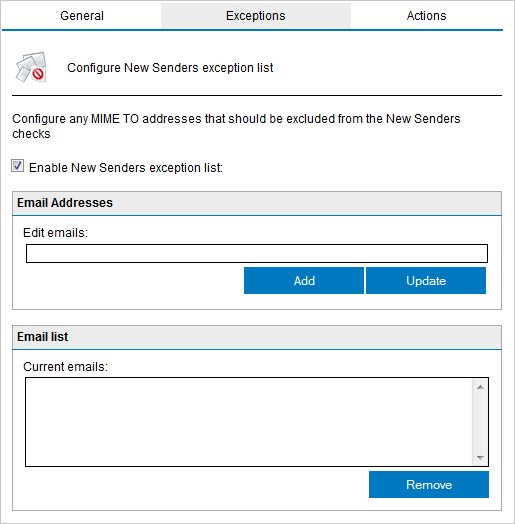 Enable New Senders exception list Select this option to enable the exceptions list. Key in an email address to exclude and click Add. Repeat for each address to add. 1. Select an exception from the Email list. 2. Edit the email address. Delete exception Select an exception from the Email list and click Remove.